On Saturday, May 13 at 11am, two popular authors from Centerville, Kathryn Wood (CHS 1958) and Garry Cox (CHS 1960) have been invited home to share their poetry and storytelling skills with an audience of old and new friends. Garry L. Cox is a teacher, poet, actor, playwright and public speaker. Garry will be reading from his book of poetry, The Waters of Appanoose County. The Waters of Appanoose County is available at Amazon.com. For an even more fun option, go to Garry’s website, garrycox.com and check out his blog and click on BOOK to purchase. Kathryn Wood will be reading from her book, An Unbroken Promise. An Unbroken Promise is available on Amazon. Copies of Garry and Kathryn’s books will be available for purchase through cash or check during their visit to the Drake Public Library. The Friends of the Drake Public Library are graciously hosting this event. 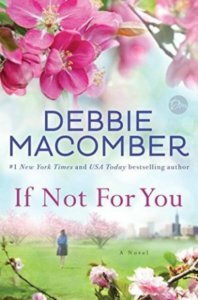 Debbie Macomber returns following A Girl’s Guide to Moving On (New Beginnings, #2) with her third in the New Beginning Series If Not For You, a charming, fun, contemporary tale of unexpected romantic connections with Macomber’s own Hallmark signature style: Second Chances. Fresh Beginnings. Self-discovery. Healing. Beth, reserved and smart, has started living her own life, out from under the thumb of her over controlling parents. She has also agreed to go on a “blind date” with Sam, who is her exact opposite and her parents’ worst nightmare…a tattooed auto mechanic who’s rough around the edges. Both Beth and Sam would have just written the date off as just another awkward set up. But, tragedy brings them together and they develop the most unlikely of friendships and eventually fall in love. Of course, there are certain hurdles that threaten to stand in their way. But that’s what makes the story interesting! Spring has sprung and I have been in the mood to read something light, fun and a little romantic. This book fit the bill and has a sweet story that really grabs at your heart. If you read, A Girl’s Guide to Moving On, some of those characters also show up in this book. Nobody does realistic, down to earth romance stories like Debbie Macomber. The Drake Public Library is seeking candidates to fill a part time opening beginning March 15, 2017. This is a part time position (15 – 20 hours a week) with a set schedule that includes Saturdays. The Librarian Assistant is responsible for daily operations at the Circulation Desk. This position requires a familiarity with authors, books and genres, a basic understanding of the internet and various computer programs, the ability to alphabetize and an understanding of the Dewey Decimal system in order to re-shelve materials accurately. The ability to and desire to work with children of all ages is required. You must be over the age of 18 and out of high school to apply. Please fill out an application at the main desk of the library and submit it to the librarian on duty. Previous applicants may reapply. Another book review by dedicated Drake Public Library reader and patron, Deb Egeland. This book has been very popular among readers who enjoy historical fiction…although, it is based on a true story. There have been a multitude of novels written about WWII and the Holocaust. “We were the Lucky Ones” is yet another. It is worth picking up, even if you’ve read many already. This book does delve into the many horrors the Polish Jews had to face. What Georgia Hunter does in addition in this book is to show how fractured families became, the prolonged uncertainty of where and how siblings, children and parents were, and how devastating that was as well. It was a horrifying and shameful time for the world. But a time that brought out tremendous strengths, allegiances, courage and fortitude. These attributes were called upon not only during the war, but also during the search for surviving family afterwards, and trying to figure out where they might safely land…and live. Read the story. Then continue to read the ‘author’s note’ and the ‘since then’. There you will discover that the story that you thought too horrible, too intense, too heartbreaking to be real, was in fact true! This is a novel about the life of American master painter Georgia O’Keeffe, her love story with photographer Alfred Stieglitz, and her quest to come of age as a woman. In this novel of a couple, and of passion, betrayal, and art, Georgia comes alive as never before. For fans of the iconic artist, you will enjoy delving into her personal life and see this transformation for yourself. The story itself is quite romantic and inspirational. Her struggles and feelings, very real. It gave me a little more insight into this artist that I have to admit, I idolize. I read this with my Georgia O’Keeffe print books handy so that I might see the paintings that are mentioned throughout the book. The Georgia O’Keeffe Museum website was useful as well. 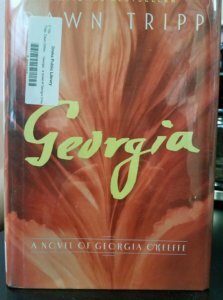 Check out Georgia: A Novel of Georgia O’Keeffe if you are in the mood for the romantic but very interesting story of an iconic artist. Deb Egeland has submitted another interesting book review on one of our newer releases. Nathan Hill’s debut novel, The Nix was named as the #1 book of the year by Audible and Entertainment Weekly, as well as one of the year’s best books by The New York Times, The Washington Post, Amazon, Newsday, Library Journal and many others. Nathan is a native Iowan, but grew up all over the Midwest: Iowa, Illinois, Missouri, Oklahoma and Kansas. He has lived in New England, New York, the Twin Cities and Chicago, but has since fled to a warmer climate and makes his home in Naples, Florida. Here is what Deb has to say about The Nix. The Nix, by Nathan Hill is a very solid book, physically as well as in story. The actual book is heavy and the story is involved. The story has abandonment, sexual abuse, protest marches, police violence…characters who don’t seem to know for sure who they are, or quite how to find out. In places, I found the telling to be rather tedious with specifics. Other times I was restless and wondered where it was going. Something kept me reading. As I turned the pages, I also turned back the clock. I was teenage during the Vietnam protests, knew about “flower power”, lived in the Midwest and am familiar with Eastern Iowa and Chicago. I could easily envision what was happening and where. As I finished it tonight, I realized that it was a good read. I enjoyed the “journey” the main characters were on. If you are looking for a book that might take a little extra effort, look at this one. The upcoming Thanksgiving holiday makes me realize how very thankful I am for the Drake Public Library and for those of you who support us. The Friends of the Drake Public Library fund children’s programming and so many other things! Thank you for working very hard to make sure that our library has whatever we need. Our Drake Public Library Foundation raises and manages funds through memorials and large donations. Thank you for ensuring the future of our library and our services. Our library Board of Trustees is a strong support for me. Thank you for planning for the future, assisting me in developing policies, and advocating for the library throughout the community. The City of Centerville provides funding for the library and I am thankful to have strong leaders within the City Council, the Mayor’s office and administrative team to help me and support the library. The staff at Drake Public Library has some of the hardest working people I’ve ever met. Thank you, Beth, Julie, Kristin, Pam, Chaz and our volunteers John, James and Nikki, for being reliable, knowledgeable, patient and kind. I am very lucky to have these coworkers and friends. Finally, our patrons…because without you, we wouldn’t be here! Thank you for kind words, patience, timely suggestions, interesting conversations, and of course tasty treats! Our patrons are some of the best and the staff at the Drake Public Library is very thankful for all of you. Please enjoy your Thanksgiving holiday. We will be closed on Thursday and Friday so that our staff can enjoy time with their families. Thank you! It’s a wonderful day when I get to help Kristin out with the story time programs. So, I just couldn’t resist coming downstairs for the Halloween party with the Rising Readers on Monday. As I was helping clean things up, one of our “library kids”, Layla, asked me “What is your favorite book in this whole library?” It took me a minute! I’m a librarian…I like to read. I could have named off a whole lot of books. But, I had a thought as I was chatting with her about what I like to read. 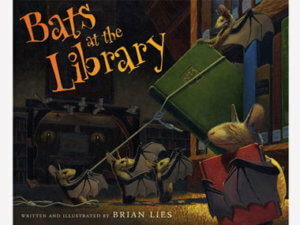 “Bats at the Library by Brian Lies!” I exclaimed. This was one of the first books that I fell in love with as a children’s librarian and storyteller. The pictures are grand, the prose poetic but very readable…it’s simply a whole lot of fun to read and even more fun to READ TO children. Brian Lies captures the amazing things that children can see and do at the library through bats who have snuck in through an open window after closing. They play with the water fountain, make photocopies, play shadow puppets on the wall and have story time. The older bats tell tales that they had learned from these books long ago and the younglings drift into pretending that they are the characters in the book. It’s a wonderful view of the public library. We started a little tradition at Drake Public Library a couple of years ago. Movie Night! This event has grown into an evening of fun entertainment for people of all ages. This Friday is no exception! We will be hosting a FREE showing of Goosebumps. The show will start at 6:30pm and we will provide seating, popcorn and water bottles. So, join us at the movies! As I went out the door to come to the library today, I noticed the frost on the ground and a chill in the air. It immediately reminded me of one of my favorite children’s books and poems. I thought it would be nice to share it with you. Its one of the many, beautifully illustrated Fall themed books available in the children’s area. Come by and take a look.